Take part and sell your wares at Scotland’s largest antiques event. A bustling weekend event, popular with locals and tourists. Join the exhibitors selling a wide variety of excellent quality stock at this entirely indoor fair. 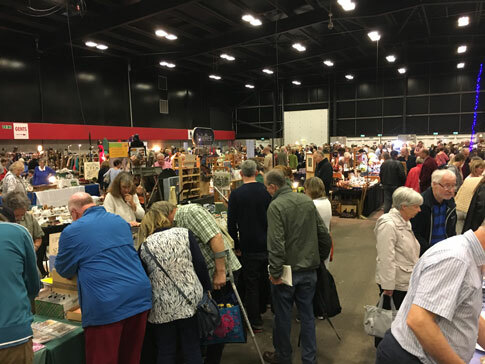 Attracting buyers from across the country, and abroad (the venue is adjacent to the city’s airport), the Edinburgh fair is Scotland’s ‘must do’ antiques fair. Experience it for yourself and sell your stock here. Thousands of buyers attend each of the four fairs. After this time, tables will be £9 each, subject to availability. Single Stand: 6ft of space with one 6ft table with SHARED access. Double Stand:12ft of space with two 6ft tables with SHARED access. - Electrical supply (it is advisable to bring an extension lead and your electrics must be PAT tested). -	ATM in the RBS Bank by Ingliston (when available). Download our Edinburgh 2019 booking form. Simply, print it, complete and return to us by post, making sure you have included payment details and taken note of the payment processing date. Alternatively, call the team on 01636 676 531 and your booking can be taken over the phone. Saturday: Early entry: 8:15am – 10:00am, £6pp. General entry: 10:00am – 4:30pm, £5pp. Sunday: General entry: 10:00am – 4:00pm, £4pp.